Hello and welcome to my blog. 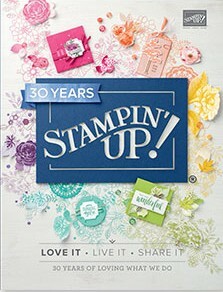 Today I’m joined by 22 fabulous Stampin’ Up! 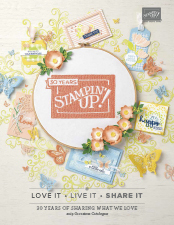 Demonstrators for a Blog Hop featuring products from the new 2018 Occasions and Sale-a-bration Catalogues. You may have hopped over from the lovely Barbara Williams, thanks for continuing on with me. I was very excited to get my hands on this wonderful new Catalogue. More excited than my assistant, Marvi, seems to be anyway. Today I’ve used a new bundle from the Occasions Catalogue called Bubble Over and I’ve teamed it with Bubbles & Fizz DSP. This DSP is free with a qualifying order over $90. Bubbles & Fizz DSP is so bright and fun, I just love it. Here’s a couple of ways to earn this DSP for FREE!!! I’ve made the cute little box with the Lots to Love Box Framelits Dies and turned it into a shaker box. The Whisper White Narrow Notecards and Envelopes fit inside the box perfectly. I’ve added some Bubbles and Fizz DSP along the top and bottom of the box and behind the window sheet and sequins. I’ve also used some new Glitter & Clear Epoxy Shapes as bubbles on the note cards. They’re very hard to photograph but look really effective. I think this would make a lovely gift for any occasion. Next up on the hop is Maree McIntosh, I know you’re going to love her project. Thanks for stopping by and thanks for leaving a comment, I love reading them all. Very cute project Peta, am sure anyone that received this would love them. Wow ! So loving the box ! I’ve just ordered this set and can’t wait to play ! Love this set of cards Peta and the shaker box is just so cool! Super cute projects Peta! That box is to die for! I love how you have bundled products together to earn the free DSP! And your projects with them all are lovely.